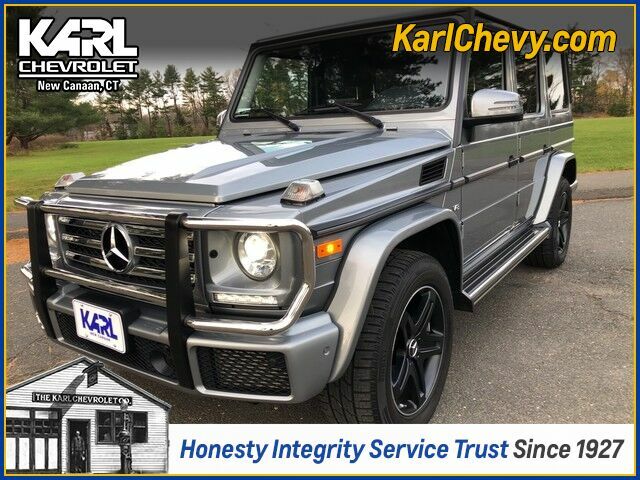 Karl Chevrolet has a wide selection of exceptional pre-owned vehicles to choose from, including this 2017 Mercedes-Benz G-Class. Classic good looks in Palladium Silver Metallic with Premium Black Leather Interior, this G550 features the Adjustable Suspension, Navigation, Anthracite Poplar Wood Trim, 19 inch Black AMG 5-spoke Alloy Wheels and much more! This Mercedes-Benz includes: POPLAR ANTHRACITE TRIM Woodgrain Interior Trim BLACK, LEATHER UPHOLSTERY Leather Seats PALLADIUM SILVER METALLIC ADJUSTABLE SUSPENSION STANDARD PAINT WHEELS: 19" AMG 5-SPOKE Aluminum Wheels *Note - For third party subscriptions or services, please contact the dealer for more information. * CARFAX BuyBack Guarantee is reassurance that any major issues with this vehicle will show on CARFAX report. Gone are the days of SUVs being the size of a tank and handling like one. This Mercedes-Benz G-Class is a perfect example of how SUVs have evolved into vehicles that are as refined as they are rugged. Today's luxury vehicle is not just about opulence. It's about a perfect balance of performance, comfort and attention to detail. This 2017 Mercedes-Benz G-Class is the perfect example of the modern luxury. Enjoy the comfort and safety of this AWD Mercedes-Benz G-Class G 550 equipped with many standard features found on other vehicles as optional equipment. Marked by excellent quality and features with unmistakable refined leather interior that added value and class to the Mercedes-Benz G-Class Time is money, and thanks to the navigation system on this Mercedes-Benz G-Class, you'll be spending a whole lot less time getting to your destination. Know exactly what you're getting when you take home this Mercedes-Benz G-Class as past service records are included. Rare is the vehicle that has been driven so gently and maintained so meticulously as this pre-owned beauty. As always, our goal here at KARL Chevrolet is to assist you to find the perfect vehicle to meet your needs. While we strive to have the area's best selection of quality pre-owned vehicles in stock at all times, we know there are times when a customer may have very specific needs. If you have a specific model or features that you are searching for, please let us know. You might be surprised how quickly we can find a match! Just another KARL Advantage .... finding you the perfect vehicle at the best overall value. Thank you for the opportunity to assist in your vehicle search.